ALREADY SWEATING AFTER packing away in the oppressive morning heat, I rolled out of the campsite and cruised along the sandy track wearing a t-shirt to the local beach thinking that was the location of the Santa Marta Lighthouse. Parking up next to a small caravan that serves as a Police station, I stroll across the boardwalks to check the beaches. Nothing there so I return to the bike. Two Police officers with a couple of locals stand around the bike chatting. I join in best I can and the Police tell me the lighthouse is 40km further south near Laguna. Curious about my journey from Peru, I tell them about the whole trip from Turkey in a mixture of Portuguese, Spanish, English and mime. I bid them ‘ate logo’ and they offer a cold bottle of water. I’m already parched and down it in a dozen gulps before riding off. Attempting to withdraw cash from the local supermarket, The check out girl pointed south to the Ferju retail outlet at Nova Brasilia. She was kind enough to write it on a piece of paper. Nova Brasilia is only 8km down the BR101 and the outlet is visible from the road only after the exit ramp. Luckily I had guessed the junction correctly and was already slowing down along the service road. Ferju is in a popular and busy retail park and a parking attendant directed me to squeeze my bike between two cars parked on a corner making a wedge-shaped space. Best of all, the cash machines were successful and I quickly became flush with cash again. The restaurant tempted me inside but was too busy for my patience so I pulled into the Restaurante e Churrascaria Boi Preto not far down the BR101 just southwest of Imbituba where, according to the proprietor’s son, is the hometown of his friend Jorginho who plays for Chelsea. The buffet was delicious and cheap too. I’ve forgotten this guy’s name now but he said if I ever pass again, I can stay at his house. I can ask Jorginho what his name is if I see him kicking a ball about in the UK. The turnoff to Laguna, 25km further down the BR101, came with the usual sense of relief and I could relax look around more while riding into Laguna without focussing so much on my mirrors. I spotted the Mirante Morro da Gloria on the skyline with its statue of Christ, arms in the air, and I weaved my way through the one-way system and up the hill. Following the signs to the Ferry, I pick up the tail of a bus winding through the streets toward the terminal. Arriving there, a ferry had already closed its gates ready to leave. Noticing the arrival of the bus it opens its gates again and I roll on as the passengers drift out of the bus and stroll onto the ferry. Over the other side, the bank looks bare and rural, save for the queue of cars at the terminal waiting for the ferry back to Laguna. There are a few holiday chalets on the waterside but mainly, from here, it’s a straight road down the coast lined by farms on the right and dunes on the left. After a few kilometres, I spot the lighthouse in the distance and by the time I reach the junction, it seems like I’m well past it. enough to question whether I had missed it a few kilometres back. Santa Marta is a quaint little town huddled over a hilly promontory into the Atlantic, popular with tourists. It reminding me of an old Cornish fishing village back home. Coverack, perhaps on the Lizard peninsula. I park the bike perpendicular to the curb to squeeze into the last metre of space between the line of parked cars and the red painted curb indicating the ‘no parking’ area at the entrance to the lighthouse then wander up the hill. A sign warning of the danger of venomous snakes in the rough grass reminds me this isn’t Cornwall. This town looks compact and probably expensive for accommodation. Riding along the seafront up to the hiking trail, there is a small grassy car park scorched by a campfire. It’s perfectly level for a tent but quite exposed to public eyes so I decide to wait until dark and ride back down to the promenade and retreat to a cafe for a beer and WiFi. It’s amazing how one beer can affect your sense of balance. I felt totally sober but my balance wasn’t as sharp as normal and I carefully wobbled over the bumps and troughs along the track back to the trailhead at dusk to watch the waves and the day melt into night. I walk back to the car park in the dark to pitch the tent. Along the way, I stumble down a hole in some thick weeds, instantly hoping there aren’t any snakes down there, as I scrabble out the other side, maybe tick off one of my nine lives on that one. While securing the poles, the beam of a flashlight sweeps across me, a local guy out jogging with his dogs. I just wave a greeting “Boa Noite” and he jogs along the cliff path out of sight. I struck camp at dawn for the purpose remaining invisible, the dew still fresh on the tent, while most people were still in bed. I had a peaceful and tranquil night here and being free of charge made my rest feel all the sweeter. I sat at the promenade in front of the closed cafe hoping for breakfast and used their wifi to check my route. I could just as easily have breakfast in Tubarãu and took off toward Braço do Norte and then hopefully onto Serro do Corvo Branco. Google maps the SC370 down as closed, giving me a 100-mile diversion via Laura Muller. I ignored it and stopped at Tubarãu for WiFi and breakfast. I headed south from Santa Marta around the lagoon which meant riding north on the BR101 for a while. It felt like I was backtracking. The SC370 out of Braço do Norte looks like virgin asphalt, smooth, wide and sweeping. My fuel gauge was half way which should be plenty for Urubici 70km away. The uphill incline tips the fuel to the back of the tank lowering the float sensor of the gauge at the front moving the needle to show near Empty and I start to wonder about fuel consumption on this persistent and winding incline. The misleading gauge taunts me, asking me why I didn’t take a moment to pop into that fuel station in Braço do Norte. Distances certainly feel further on the ground than they look on a map. Up ahead is a Tolkien-like landscape and the SC370 becomes single lane unpaved track as If I’d strayed through a farm gate without noticing. The difference is enough for me to stop and check behind me and interrogate the GPS. There’s nothing to suggest I’d made a wrong turning. Checking Google street view later clarifies things. the images from 2011 have the SC370 as a dirt track so the upgrade to immaculate asphalt is very recent and ignore the difficulties of the mountain pass. In the distance, a white car becomes visible on the side of a mountain and disappears behind the vegetation again. The track continues up the mountainsides in the style of Peru and Bolivia and soon I arrive at a series of hairpins and stop to get the GoPro out… just in time for the last bend. I park at the top to admire the view back across the gorge and the cleft where the road crosses the peak behind me. I see a truck with pallets of bricks grinding its way up the lane. Below me, it disappears from view but hear it change down a gear for a steep corner followed by a loud metallic rumble. When he reappears, one of the pallets is a heap of rubble on the back of his truck and the truck continues the climb and crawls past the last turn past me over the peak. After a few moments, I follow over the peak, my mind is at ease. I coast down the wide gravel track on a closed throttle and the fuel sensor rises on the fuel flowing to the front of the tank and the gauge settles at a quarter. Coasting downhill uses almost no fuel but Maps.me puts a fuel station 30km away and I rejoin immaculate asphalt gently cruise along the sunlit valley toward Urubici, ignoring the tempting detours to morros and waterfalls. This waypoint looks and feels different close to. I’m already at the coast and Florianópolis now lies less than 50 km south. The first waypoint in the big plan, such as plans go. Porto Alegre would be the next, comparatively only just down the road. Meanwhile, at brunch here on the edge of BR101 after a restful night in the woods near Mirante do Encanto, I Imagined that finding accommodation would be a greater challenge, with prices reflecting demand now that we were in the height of holiday season. I could find no reasonably priced sites or hostels on the internet, even in the more downmarket town of San Jose on the mainland opposite Florianopolis. Ah well, I’d have to just live with the uncertainty for the day and see where I’d end up – just like yesterday. Exiting the ramp of the busy BR101, I inserted myself along the queue along 282 across the bridge into Florianópolis. Across the bridge on the island, the traffic interchanges become fast and confusing. The city is to my left and the signs for “Centro” point right. Reading the signs full of unfamiliar Portuguese words and quickly change lane becomes the new challenge. The exit could be either side as roads loop around over and under bridges. These are dual carriageways with no u-turns. there’s no telling where a wrong turn would land me. Florianópolis is a high rise city full of one-way streets and forbidden turnings. It makes exploration frustrating. I need some cash but have seen no banks as yet. This is an unpleasant experience in paradisical scenery: a picture perfect labyrinth… like I’m stuck in a video game. On the northern coastal perimeter, the wide dual carriageway separates the city from the shore. A beautiful seafront promenade that’s difficult to stop and enjoy because of the fast flowing traffic. I turn right toward the city again hoping to find a road junction that will allow me back to the shore to cross to the opposite carriageway. No right turn. Onto the next traffic light. Right then left, and another right to the traffic lights and I finally unlock the side of the perimeter now that takes me anticlockwise toward the bridge and access to the south of the island, the interchanges shouldn’t be too bad since I’ve already traversed them, so I take a break at a seaside cafe on the promenade. Checking the app on the phone, there is mention of a camping spot at a trailhead at the south of the island some 35km away. there was no rush. I finished a couple of ice cold juices and joined the perimeter to exit the city southwards. The interchange wasn’t too much of a problem and I happily cruised south. I saw the squall early, sweeping over the southwestern mountains on the mainland and across the strait. The rain had already started to fall when I spotted a gas station up ahead and pulled into its lean-to cafe shelter to buy a coke and hide from the storm. The wind drove the lighter rain horizontally over the seats and tables and I sought out the least affected spot while the warmth and light of the day slowly blew away. The wind and rain eased a little so I rode next door to wander around the Hypermarket for something to do, and use their WiFi for Skype calls home in the covered car park until the rain stopped. After an hour, the rain still hadn’t stopped but it became light enough that the ride would be less of a sufferance than waiting for an uncertain period in a supermarket car park, and I splashed along the glossy black roads through the soggy grey air. Continuing down the quiet undulating coast road under the cold grey sky, the weather along with the proximity of mainland Brazil across the strait reminded me of driving along the banks of loch ness in Scotland. It was hard to believe this was a strait and not an inland lake. The rain never really stopped. The air was still heavy with water and sporadic outbreaks of drizzle drove me into bus shelters so I could thoroughly examine the sky upwind. Along the way, I discovered a “plan B tent-pitch” behind a bus shelter, overhung by tall bamboo trees, hinting at an element of seclusion. Not ideal, as there were houses across the street but felt adequately safe in case of an emergency. I sat in the bus shelter surveying the scene for a few minutes. Opposite, a car park at the foot of a hill that hardly resembled the description on iOverlander.com but there was nowhere else remotely like it. A white Renault arrived and paused at a gate. A family peered through the windows at the stranger in the bus shelter next to the overloaded bike while an electronic pulse signalled a gate to slid open before the car spun some gravel under its wheels and climbed the drive to a hideaway lodge further up the hill in the woods. I walked across to the Car park. Three cars parked on the inclined plane of half gravel and grass. A wooden office shack on the far side from the road with Portuguese notices about litter and with directions to the banheiros was locked and silent. Behind the office were the banheiros. Above and beyond that, a level plateau of grass for further parking hosting only a ford transit minibus. Thumbs up, in my mind. I trotted back down the hill to retrieve the bike, crossed the lower incline of the car park and powered up the steep rocky rack to the level grassy plateau to pitch the tent in the fading daylight. I felt relieved to get shelter. Even though the rain had stopped, the air still felt cold. Across the miniature valley in the trees, I could see the family that drove by in the Renault relaxing on their porch and gave them a wave before settling down for the night. I was damp from the drizzle but only in my top layer. Despite the colder evening, I felt warm in the still air of the tent’s interior. Awakening to the sound of over-animated Portuguese chatter, I poke my head out of the tent, a dozen or so young people congregate around the Ford Transit, I’d noticed yesterday, in preparation for a hike. I might as well get up and pack and go… On the way out I meet the car park attendant and pay the 5R$ camping fee, about £1. what a find in the height of the season. Muito tranquilo and fully refreshed. Sunday 20th January, replaying the reverse series of aromas of the trees as I retraced my journey north. The morning quickly warming up as I edge east toward Campeche on the Atlantic coast of the island. The beach at Campeche was already busy and I chatted with the parking attendants for a few minutes. I stayed just long enough to enjoy an Ice cream near the beach before riding off back to Florianopolis. To the north of the city, I heard is where the wealthy reside. There’d be nothing there for me so I return to the city itself, this time via Lagoa and Itacorubi. I was looking for a cafe and spotted one through the trees on a service road and backtracked to the junction. When I finally parked, it turned out to be a Gelateria, an ice cream shop. Despondent and about to ride off, I noticed that next door was the unassuming looking cafe D’lara. Electricity for the laptop, Wifi, Coffee and Cake. Perfect. Ralph spoke English well and Veronica baked moist, rich cakes. I bathed in the warmth of their company. Solitude helps me appreciate these moments along the way. I needed cash and tried to navigate to the ATMs I’d found on internet maps. The junctions are complex and funnel around loops often in the opposite direction to where the location I want. the one-way system means negotiating driving around blocks and finding an elusive parking space is difficult even for a small motorcycle. Banco do Brasil had closed down, another ATM, I could find no trace of. I gave up and set off for the ATM in San Jose over the bridge and down the BR101. I found the ATM but it didn’t service foreign banks. Failed! Short of cash and getting late, I set off to find a campsite for the night and deal with the finances later. 90km to Alto Arroio and it’s a relief to get off the fast and furious BR101. Not far away, I discover the campsite, Camping Do Quintino, next to a lagoon. A compact, leafy, rustic site. The woman who received me didn’t speak English but we managed to communicate well enough to check in. There was only one other camper, a Mercedes Sprinter, whereupon I met Paulo Lazier. He gave me a list of places to visit including Farol de Santa Marta, Serro Corvo Branco, Serra do Rio do Rastro, Cambara do Sul, Canela and Bento Goncalves. A big deviation from the monotonous BR101 hammering its way south along the coast… riding along the BR101 is no way to experience Brazil. It may be efficient but it has no soul… and soul is what I’m looking for. The road approaching Blumenau stacks with crawling traffic and I traverse a busy roundabout to stop in the shade of some trees just past the junction to see whether that was the one for the centre. A Honda with a young man and woman on the pillion, Bautista and Maria, pulls up alongside and we chat about my journey and their trip to Ushuaia. They disappear into the traffic and after a couple of minutes return to hand me a 20R$ note. I feel very moved by that gesture. I tuck away the note in my wallet and U-turn to join the traffic queuing for the roundabout and turn south across the river toward the centre. It’s the usual introduction to a city’s one-way system. Never the most enjoyable experience. eyes are needed all over the head to watch for signs, junctions, the direction of parked cars – indicating the likelyhood I’m about to drive up a one-way street- traffic ahead and traffic behind. Usually, locals know these roads well and drive at the maximum speed leaving little quarter for newcomers feeling their way around. It’s Monday. Monday is like ‘Sunday Lite,’ in South America but this one is also a holiday. There’s a beer museum next to the restaurant I want to go into. The museum is closed and the parking bays are all empty but the signs expressly forbid motorcycle parking. It’s difficult to find a cafe where I can keep an eye on the bike until I pass Vila Germanica to find Fritz Saudavel opposite the Ramiro Ruediger Park. Tapping into the WiFi, I scour the internet for accommodation that fits my budget. There would be no camping in a city this large. I locate a sweet sounding pousada back over the river on the northern perimeter of Blumenau, Le Petit Cherie. I fight my way out of the one-way system and cross the river to the busy route 470 and cruise along the commercial zone bursting with car dealers to find a steep slope that is the “Rua Walter Erich Obenhaus” leading to the pousada. I found the road easy enough but the pin in the map for Le Petit Chérie is wild woodland in reality. Around the bend at the top of the hill is a neighbourhood of a dozen or more houses and there is no sign indicating a hostel or pousada. Halfway down the steep slope is a possible candidate, tucked in the woods but with a firmly closed security gate. I cruise up and down the hill a few times before stopping to gaze at the house in the trees again. It’s the only house on the same side of the road as the pin but it doesn’t look like a pousada. Across the road and behind me is a scrap metal merchant and someone comes out to find out what I’m doing. I explain and show the young man the map and he doesn’t know of any hostel. All the staff here are curious now and chattering and shrugging with each other. The young man offers to help and gets his motorcycle to ride up the hill. We don’t find anything but he asks someone in their garden and they say something in Portuguese pointing to the corner at the top of the hill. We park at a big white gate at what looks to be a private secure house, opposite and just around the corner to where the pin is on the map. A man opens the door, says something and shuts the door again. Not sure whether he said he didn’t know where it was or not and retreated indoors, I waited with my guide and Roberto reappears a moment later fully dressed welcoming me to Le Petit Chérie. I shake my guide’s hand before he rolls down the hill back to work. Roberto works for Civil Defence, mostly at night so we probably disturbed his sleep. I get shown a dorm opposite the house and Roberto says 25R$ a night. I tell him Booking.com had it at 27 and gave him that intending to stay for one night. The warm humidity gives way to the welcoming cool of a thunderstorm. Relief for me but not for Roberto, as flooding takes him off his vacation and back into Blumenau for work overnight. The next day is bright and warm and I decide to stay another night and take a ride down the road to see if I can find some faster internet for updating my blog. Norte Shopping Mall on Ruta 470 is a giant characterless edifice in the style of the Malls I’ve seen in Texas. It’s air conditioning and food hall make for a good working environment though and I catch up on a few hours of editing, publishing and uploading photos. After dark, Roberto and Sonia invited me into their house to try the local beer. their English is good which makes for an easy night for me and I revel in their warm and friendly company. Receiving tips for visiting Pomerode and its delights prompt me to stay another night. I’m still there four days later, having visited Pomerode and various excursions to the giant mall for working online. In the evening a tap on the door reveals Sonia offering me coffee and chocolate biscuits, we chat briefly before she retreats across the garden to her heme. Roberto is busy with Civil Defense. Recent storms have funnelled down the valley sides and flooded the river that runs through the city. Since storms appear nightly, he works all hours. Officially, Roberto and Sonia are on vacation but the reality is that they can’t go anywhere since Roberto is also on standby. All hands are needed in Blumenau during stormy weather. Sonia told me about the building of the pousada and the trouble with local builders pushing up the price and their delays. It was a very stressful period and I glad they survived it. Their location is tucked behind a commercial zone but you wouldn’t know it when you’re there. Up the hill, it’s quiet and surrounded by trees. People are slowly clearing the woods to build houses so I hope that stops soon to retain the tranquil feeling of the area. There’s always a temptation to stay one more night at places like this. My three day trip to Florianopolis is already well past a week and I force myself back on the road. Sonia packed me some chocolate biscuits I didn’t know that she made them herself and they had been a real treat in the evening with the coffee. She also gave me a bottle of fresh açai juice from the fruit in the garden. It’s not far from Blumenau to Itajai, 60km or an hour’s ride. Itajai is a major port north of Florianopolis. I resisted the urge to explore the city and take the bypass south to Balneário Camboriú. BR101 is a major artery down the coast. Fast and aggressive dual carriageway. Sure I could make Uruguay in short time but what would be the value in that? January is holiday season in South America and I peel off down the ramp of the free-flowing artery of 101 into the clogged veins of Balneário’s streets. Bizarrely, the coast road is one way from south to north so I painfully creep down the gridlocked city centre, bike too fat with luggage to filter between the lanes, and turn left to the promenade and idle up the beach road, hugged by high rise buildings on the left and crowded golden beach on the right. I felt like I was on holiday myself and stopped for an ice cream. Girls walked down the street wearing skimpy bikinis and thongs adding to the exotic ambience of the resort. Apart from the occasional signs in cafes requiring t-shirts, people carry on without being offended by semi-nakedness. It makes the UK look like it’s still in Victorian times. Finishing the ice cream, I decided I’d seen all I need of this pretty tourist trap, flick up the side stand and filter through the gridlocked streets southward. Sonia recommended the coast road of Avenida Interpraias and I weave my way to that, a scenic undulating coastal route linking idyllic Atlantic beaches. I didn’t stop except to check the map and plan where to stay for the night. There’s a Mirante not too far away at Itapema. Mirante do Encanto. I visualised it as a tranquil grassy mountain peak with perhaps a small monument. But no, I spotted its silhouette on the skyline from the BR101, a huge tower on a hill complete with a viewing platform. Up on the viewpoint is a picture postcard view of the bay to the south but I scanned the woods for camping opportunities and spotted some trash near a dirt track and traced a line made by a gap in the treetops to the likely entrance to the trail and returned down the stairs to the bike to go and investigate. Along the trail are gates to private residences. I pass a house under construction plus the trash I saw from the Mirante to a forbidding looking slope of mud tracks. I slither down and power up the next rise to find a fairly secluded spot to pitch the tent. Any tyre tracks that were here had been washed away by rain so I shouldn’t expect any traffic tonight. I had a peaceful night apart from the rain drumming on the tent and I thought about the return up the already slick slope I had slid down. The lane continued in the other direction to an excavation. I explored as far as I could but there was no way out and I returned to the slope riding up it as fast as I dared. I needed grip both for traction and for steering and I had little of either. I reached two metres from the top before I came to a halt and stalled the engine to stop it rolling back down. I dismounted pushing the bike with engine revving and rear wheel spinning carving a groove in the clay, but I made it to the top without having to unpack the bike. Even on the now level trail, it was difficult staying upright and I wobbled down the trail with my feet off the pegs to the junction with the asphalt continuing down the hill on the road from the Mirante. I awaken to sun filtering through tall pines, scattering luminous yellow patches dancing across the fabric of the tent. I lay there for a while, listening to the sound of the distant traffic ebb and flow. Unzipping the door reveals a picture perfect woodland morning and after a few handfuls of peanuts for breakfast, I’m up and out for the tedious task of packing away. In the distance toward the road, I see two men on the trail near the edge of the woods but they don’t look my way. I don’t know what they are doing but they are gone by the time I’m ready and wobble through the channel through the undergrowth. Engine still cold and underpowered, I have to gun it up the slope to the road and I just have enough power to make the grade and just enough grip to stay upright along the slick muddy incline out of the woodland shade and into the sunlight. Through the gap in the long grass, I have to stop my front wheel on the edge of the asphalt and bend over the handlebars for a clear view of the road, nothing is coming and I lean left towards Caçador and give the engine a burst of throttle. I’m feeling buoyant in the dry warm sunlight and weave around the pale grey asphalt in a joyful 70 km/h slalom around the potholes. It’s 250 km to Rio do Sul and I settle down into the saddle with the harmonious hum of the Yamaha motor and flow with the intermittent traffic in the warm Santa Catarina sunshine. I probably had lunch along the way, I don’t remember. Most of the day was a dreamlike drift in the sun, mostly on autopilot while my mind wandering elsewhere left my body to handle the controls of the bike. Early afternoon, I notice brown Turismo signs, “Vale Europeu” and the route tips the balance to more tourism than agriculture. 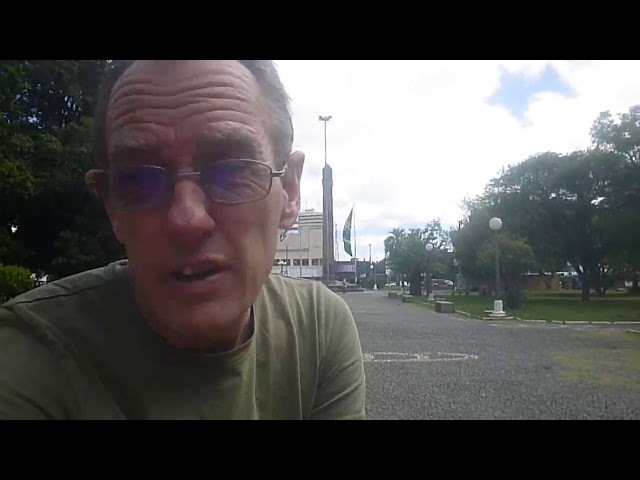 The traffic thickens along with the number of properties lining the road and I arrive at Rio do Sul failing to notice any camping opportunities between the fences along the way. The car park is huge and, now past 5 pm, the park bustles with people. As described on iOverlander, there are toilets, showers, bar and restaurant nearby but nowhere obvious to pitch a tent without becoming an instant celebrity. I park the bike amongst the local scooters at the entrance to the car park and walk around the central area where the showers, seats and teenagers on phones huddle in the shade of the bridge. I dawdle around the perimeter looking for a crack in the scenery to hide a tent for the night. A jogger stops to ask me about the bike. I’m amazed, the bike is now 200 metres across the park from us. I’m more noticeable than I anticipated. I doubt whether he ran around the track especially to talk to me but he obviously noticed my arrival. We talk for a few pleasant minutes before he jogs away. I consider whether I have the audacity to camp on the soccer field. The park is teeming with urban life, cyclist, joggers, dogs and families. Camping in the car park with a motorhome? Perfect. Tent on the field? Asking for trouble. iOverlander, after all, caters for motorhomes. I travel on its coattails. Disappointed, I wander into the bar for a consolation cold beer and emergency WiFi, scrolling around iOverlander on my laptop working out where to pitch for the night. Akaiaka is 9km northeast near Lontras… perhaps I’d find somewhere on the way otherwise it’s an unwelcome dent in my meagre budget on my way to the coast. I reluctantly press the starter while hanging on to the mood to kick back and relax. These times are dangerous for motorcycling. the beer didn’t help, but I maintained conscious awareness and patience. There is no rush and the impatience is a rogue emotion. Rejoining the 470 is no easy task. Unable to reach the elevated eastern carriageway through lack of a ramp and passing under the bridge, forbidden to cross the traffic to join the westbound ramp forces me North to a U-turn a few hundred metres further up and on the way back I miss the turning west and get trapped in the Harry Hobus one way system once again. The second lap I get it and I’m westbound in the wrong direction but at least on the right road. I notice a sign “Returno 2km.” 2km in the wrong direction is a long way: 2km there and 2km back: double trouble. I scan fore and aft for traffic. Nothing is coming and swing a U-turn between the raised lane dividers and resume my heading east. Vale Europeu continues much the same, a suburban alley of pines, advertising hoardings and private property channelling prospective customers along a gulley of recreation-based commerce. It seems every millimetre of land is bought and paid for, either private or reserved for paying customers. Without any hint of squeezing in a solo camping opportunity. I spot the Recanto Akaiaka sign on the left well before the turning and pull over to the hard shoulder on the right to examine the entrance and wait for a gap in the traffic. There’s a Cafe up the gravel drive not far from the road and I cross the highway through the gap in the traffic to crunch my way up the gravel slope and pull up in front of two young guys sitting outside the cafe on the customary Latino plastic patio chairs. A little English is cheerfully spoken and I’m directed up to the main Restaurant near a copse of pines. Karin and Mauricio come out to meet me and wrestle with google translate for a couple of minutes before calling their son, Tiago and his wife, Danusa, from the house further up the hill. Tiago speaks fluent English, although rusty with disuse, and says I can use one of the cabanas. I say I’m fine camping, but my hosts insist and raise their hands with fingers pointing down in the universal sign for rain. “Chuva” they say. and they say for free when I ask how much. The condition is that I eat in the restaurant. It’s a fair deal. I’m hungry after my recent diet of peanuts and rolling countryside. Akaiaka is a popular restaurant and I can taste in the food the reason why. This is luxury living, especially compared to recent days. Finishing the meal and catching up on messages, I retire to the cabana. A nice soft mattress, electricity, and shelter from the storm that rattles its chuva all over the roof. I flick off the light and watch the square of the stroboscopic window flashing from the storm behind the curtain. Thunderbolts and lightning… and I fall asleep with Bohemian Rhapsody on a loop tape inside my head. Sunday morning brings sunshine and I ask if I could stay another night if I buy another meal. The restaurant is closed so I offer to pay but they won’t have it. I feel like family and humbly grateful. The son’s cafe near the road is open until 7pm, so I eat there instead and get to know Marcelo and Laura who seem keen to learn English. Sunday 13th January, I breakfast at Marcelo and Laura’s cafe until late morning and then lounge in the hammock. I’m invited to join Karin and Mauricio for beer in the afternoon down at the Cafe after they finished the cleanup at the restaurant. Sunday dinner was a blockbuster with over 200 people. I wasn’t surprised by watching all the cars coming and going between snoozes in my hammock. Over a beer, I meet Neno. Neno owns the Yamaha dealer in Rio do Sul and Blumenau, a successful motocross racer, having ridden to Alaska and back. He doesn’t speak English but was translated for asking if I needed anything sorted on the bike. I couldn’t think of anything and forgot to ask where the mixture air-fuel mixture pilot screw was on the carburettor. And the main stand is bent leaving both wheels on the ground… It doesn’t matter. The bike is running fine. I’m promised a tour of the dealership the next morning. Something I look forward to and gratefully acknowledge. In the morning Mauricio takes me to breakfast in Rio do Sul. It seems everyone knows everyone and I listen to the Portuguese bounce around the cafe, kind of knowing the tune but not the lyrics. Then to Neno’s dealership and onto the grand church of Rio do Sul then the waterfalls on the way back as well. I’ve had the VIP treatment. I like it here and it’s hard to leave. Iguaçu Falls had been one of the major milestones along my meandering path across South America. It was also responsible for my northerly track in Paraguay from Encarnación into Brazil instead of continuing south to Argentina. Thus, there was no longer a reason to keep me here in Foz do Iguaçu. I’d been here 5 nights and I have to beware of the smothering beast of ‘comfort’ sneaking up on me. Familiarisation of a location encourages roots of habit probing fertile ground for establishing a new home. The beast tells me “Stay here, life gets easier.” but what it does is use its cosy blanket to try to suffocate my spirit. This morning was born hot and airless, whipping up a lingering sweat from the lethargic effort of packing and loading. I had one more rest in the hammock to cool down and gather my thoughts before taking off. “I’ll have to get one of these…” I thought to myself. Especially after the lack of places to rest at Tati Yupi. I’d short-changed myself by not buying a hammock sooner. On my way to Ruta 277, I discovered the kiosks where the hostel receptionist said I should look. Cheap. Only about £15, and I double strapped it, still in its black bag, on top of the luggage on the back of the bike. At the junction to 277; down the road to the left lay the border with Paraguay. I glanced that way beyond the traffic one more time before turning the page into a brand new chapter, turned right toward the Atlantic coast of Brazil. Florianópolis on the coast was the next big box to be ticked and that was about three days away. Two if I was desperate: 930km via Curitiba. Much of 277 is fast smooth dual carriageway necessitating a constant watch in the mirrors for tired truck drivers roaring up behind me. Over a long period, it becomes tiring and numbingly tedious. The further from Foz I got, thinner the traffic became and two hours saw me about 150 kilometres away with dark clouds looming over the horizon ahead of me. Right then, a convenient cafe appeared around a bend.in the countryside. Just the job… an oasis of relief from monotony and foul weather. My waterproofs had blown away somewhere between Cuidad Del Este and Tati Yupi so my revised tactic was to dive for shelter before encountering rain and wait for it to pass. After the rain, the air feels surprisingly cold in contrast to the sweaty heat of Foz and I stop to retrieve the orange mountain jacket from the pannier. A couple of hours longer in the saddle, I’m cold and tired and had already ducked into bus shelters during brief showers and a false alarms by the time rain started to fall consistently at Nova Laranjeiras. I swung into a supermarket to buy some peanuts and beer for later but I sat on the sheltered seat outside the supermarket grazing on the nuts, keen to move on but reluctant to get wet, listening to the car tyres hiss on the shimmering asphalt as they drove by. I set off as the rain eased but before it had spent its last few drops, and by the time I reached the junction for Rio Bonito I felt chilled to the core. Just before the junction, there’s a terrace of shops set back in a large layby including what looks like a trucker’s cafe. I doubled back the fifty metres or so, and pulled in to warm up with a hot coffee and meal. The sky threatened rain but the clouds appeared to slowly creep away and I felt certain the sky brightened a little despite the looming dusk dragging the afternoon westward into night time. Rerouting along the more southerly Ruta 280 toward the smaller town of Caçador instead of Curitiba looked the part. Perhaps longer, certainly slower. This put Rio Bonito en route which made me feel better about that particular detour. I didn’t even care if the road turned out to be dirt track, as long as it was warm, peaceful and scenic. Somebody showed me a picture of a sinuous mountain road in the state of Santa Catarina. I was in that state now but had no idea where the pass was. A simple question in a Facebook group returned dozens of sarcastic and unhumourous replies but, later, also the single answer revealed. Further south, I would visit Serra do Rio do Rastro in the weeks to come. I only had 15km to the camp spot which I estimated half an hour if the trail was typically rugged cobbles or earth. I wanted to be there by dark so paid the bill and bid my farewell to the friendly proprietor of Lanchonette Rodovia and traverse the huge layby back to the road. I pull out onto the last few hundred metres of the 277 before the junction with Ruta 158, turn south on the dim and chilly asphalt to Rio Bonito do Iguaçu and then rattle along the cobbled track in twilight down to the Rio Iguaçu lagoon, its presence betraying the likely existence of a hydroelectric dam somewhere in the valley. I had been travelling east all day but this route southwest now drives me into the clutches of a squall which starts to pummel me in earnest only about a kilometre from my destination. I locate the site, squinting through wet, misty spectacles in the gloom, and ride directly into the picnic area past the “Veículos Proibidos” sign and pitch the tent as fast as possible. By now the downpour is established with the wind is driving the rain at a shallow slant soaking through my coat to my back as I wrestle and pin the tent to the ground. My eagerness for shelter seems to put every movement into slow motion but finally, I get the rainfly fastened over the dome and dive inside into 1cm deep puddles. The vulnerability of the design of this tent means that the waterproof groundsheet becomes a paddling pool while setting up in the rain, The rainfly can only be added after the inner is securely up. Kneeling in water, I use my microfibre towel to sponge out and dry the interior the best I can. My clothes and bags are wet but the bag’s contents are dry and I do my best to keep them separated from the wet items. Almost dark, I decide to turn in, stripping off my wet clothes but keeping on my t-shirt and underwear hoping that my body heat will dry them out while I sleep. It works I awake dry and warm but the clothes I took off are still soaking and I get dressed cringing like I’m wading into a cold pond. The warm morning sun dries out the tent while I’m packing and I’m away by 10.30. I feel content in the dry warm air under a blue sky marbled with white cloud. It should be a good day for drying out in the airstream on the bike. People sit in the cabana about 60 metres away and I give them a wave wondering whether I should offer to pay for camping. I decide to coast out of the park slow enough that they can approach me if they want to. Nobody moves and I retrace the trail back to Ruta 158 and turn on my revised route south. The warmth of the sun, the rustic roads and the chill of the air reminds me of Anglesey where the wind blows steadily off the Irish Sea before being thrust upwards over Snowdonia condensing the moist air into thick dark clouds. These quiet country roads of rustic asphalt become a more agreeable platform for absorbing Brazil’s natural ambience as its grass verges rush by to the hum of the Yamaha motor. By lunchtime, the sun burns strong from overhead, branding thoughts of refreshment and urging me to park the bike in the shade at the side of an inviting looking roadside restaurant nestling behind a gas station. Walking in and picking a table near the window, I order lunch and orange juice and relaxed and gazed out over the white-hot expanse of dust and gravel to the road about 100 meters away watching the world going about its business in, out and past the gas station here on the edge of town. I finish my second cup of coffee, pay and step out into the car park. The sun has moved far enough so the bike is no longer in the shade and everything feels hot to the touch. The air stream that dried my clothes earlier now only has to keep me cool. I stash the dried jacket back in the pannier and ride in my fleece and t-shirt since it lets the air through to cool me and protects me from sunburn at the same time. The arm and leg shields in the bag have never been used. 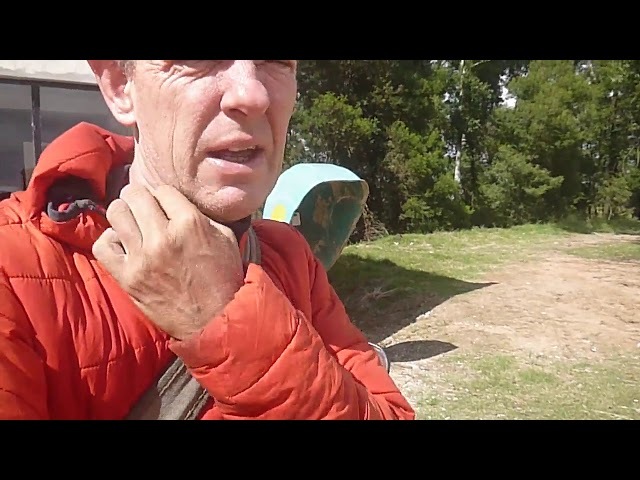 Correction, they were used once on the mountainside stretch between Santa Teresa and Santa Maria returning from Machu Picchu, Peru but they wouldn’t have helped the 100-metre plunge off the trackside cliffs and I got a sweat rash under the straps. They are too uncomfortable to wear. I need to get rid of them. I ride as I first started on my first bike in 1979: plain clothes. I just have to make sure I don’t come off… it could hurt more. The shadow stretching out ahead of me tells me the afternoon is wearing thin. Up ahead dark clouds gather but seem to be moving in the same direction as me. I’m 40km from Caçador before I hit cold air and wet road. The sun is still bright in the azure sky behind me but the storm has already visited here not too long ago and I’m gaining on it. I didn’t want the same experience as yesterday so started looking for somewhere to camp, but where? Most places along the road are fenced off and there is nothing shown on the map between me and Caçador. Out of the corner of my eye, I catch a glimpse of a gap in the grass bank to the left and double back for a closer look. Tractor tracks carving their way into the woods. I follow the muddy tracks into the wet undergrowth of a pine forest, no gates, no fences. This could be a logging track judging by all the trucks I’ve seen along the roads fully laden with stripped and cut pine trunks. Down a slick muddy slope, I turn right onto wet grass and pine needles to discover another narrow track traversing a ridge. High ground is what I need if it’s going to rain again. Over the ridge and down the slope is a beautiful pond. The water looks too green to drink and the ground is too low to ensure dry camping so I return up the slope to the crest of the ridge. I can see traffic on the road from here about 100 metres away but they can’t see me this far into the woods and I pitch the tent on the crest of the ridge directly on the trail. I expect no traffic due to the established plant growth all the way along it. The trees dampen the noise of the passing trucks and cloak me in a blanket of silence. The last of the day’s sun paints tiger stripes through the trees across the orange carpet of pine needles and picks out the pale emerald raindrops hanging on the ferns and leaves of the verdant undergrowth. Cool and colourful: literally and metaphorically. I attempt to string up the hammock using the straps off the bike. They aren’t long enough for the diameter of the trees, it’s not warm enough, it’s too wet and a few mosquitos persuade me to retreat to the tent. There’s an understated life force here in the peace of the forest, without boundary restriction or regulation. This is what we are born to, the gift of life, why should my first thought be “Am I doing wrong by simply being here?” The answer is, it shouldn’t and perhaps even asking the question is a form of insanity induced by the conditioning by and for civilisation. A civilisation that keeps us chained to the treadmill of work, money and sleep blindly trying to keep up with the ever-accelerating pace of modern life at the expense of our innate humanity. Where does all this paper authority and artificial restriction come from? Ending the fast and leaving Tati Yupi felt as if it were my first day out of prison, Reintroduced to society with freedom to roam again. I enjoyed Tati Yupi but I had been keen to escape my self imposed austerity. The meal at Hernandarias had been an anticlimax: functional food with little enjoyment. I cruised the few short kilometres and parked my fully loaded bike in the ITAIPU Binacional Car park and signed up for the tour. I bought a hat from the gift shop to protect me from the sun but I didn’t need it. There was little walking between the buses and the viewpoints so I just looked like a dam tourist. The ITAIPU site is immaculate. Air-conditioned buses drive a circuitous route to the viewpoint and along the dam. Everything apart from the English subtitles of the film in the immaculate cinema was in Spanish. The tour from the Paraguayan side is free but the Brazilain side is paid but you get the privilege of seeing inside. Back in the city, many hotels appeared to be closed for refurbishment. The ones that were open were more expensive than their equivalents further out of the city. All I wanted was a few nights on a soft mattress and some air conditioning. The Hummingbird hostel came up cheap, air-conditioned and not far from the centre. The people were very welcoming although the place looked a little tatty around the edges. Sylvia gave me some sheets and showed me the last available bed in a four berth dorm. It was basic but clean and comfortable. The Dutch guy next to me didn’t say much and left early the next morning backpacking southeast toward Argentina. The two Korean girls were friendly and chatted happily in English. They also left, leaving me in solitude for the second night. The dorm was hot in the late afternoons. The air conditioner didn’t come on until dusk and the single skinned walls shared the hot rays of the afternoon sun with the dark interior. I discovered the Wunderli Cafe as an alternative haven just down the road. I could hang out there in cool, air-conditioned comfort. Both the hostel and cafe bordered a large tranquil park that seemed to be left with a wild but tranquil edge. I was close to the city but far enough away from the hustle and bustle of the markets and malls to experience the calm of nature. I’d describe Cuidad Del Este as a commercial hub. It has little charm or tourist appeal but I liked it. I felt like I lived on the edge of another world, which it is since it looks east across the Paraná at the vastness of Brazil. This is somewhere I could live easily long-term on short-term tourist visas, border hopping to Argentina or Brazil to refresh the rubber stamps in the passport. Cuidad Del Este doesn’t try to be anything other than itself. I had booked into Hummingbird for two nights and would have liked to have stayed longer but they had already been fully booked for the weekend. Instead of looking for somewhere else in Cuidad Del Este, I decided I’d cross into Brazil and find somewhere to stay in Foz do Iguaçu. It knocks down a barrier for thinking further ahead for my continuation to the Atlantic coast. The border offices are at each ends of the bridge. Migraciones was straightforward. Stamp, vamos. Paraguay’s Aduanas offices were hard to find and turned out to be the little blue kiosks between the carriageways. They looked like toll booths. I handed in my blue form and was waved away without any receipt or acknowledgement. The bike lane across the bridge was barely wide enough for my loaded bike. And I’d feel the bags brush the concrete barrier where the lane narrowed by displaced blocks. Not all the traffic stops at the border offices. There’s a steady stream across the bridge in both directions. A helpful young girl at the Brazilian side spoke English and spared the time to guide me to the correct desks. The Aduanas office was like a warehouse despatch depot. A steady stream of people were ferrying boxes of goods out of Paraguay and into Brazil via the rubber stamps of the Aduanas customs officials. From the road, the border looked so busy that I expected to spend the day there. I was through within an hour. Seems most of the traffic drives straight over the border without stopping. Mandala Hostel came up cheap and close to the centre of Foz do Iguaçu on booking.com and I booked 5 nights, straight off, via Hummingbird’s WiFi. It’s always a risk committing to a long stay but I wanted a secure base for exploring the falls and catch up on some work. The hostel looked like a large converted bungalow. A Hammock in the front garden and big rooms full of bunks. Two bunks in my room were doubles so they alone would take 8 people. The other four were single bunk beds so that was another 8. At most, there were 13 of us overnight and it was interesting to observe that all of them were engrossed in their smartphone screen, even the group of friends that settled in that day. I smiled to myself and returned to my facebook app. Foz do Iguaçu is the second most visited tourist site in Brazil. Consequently, backpackers would come and go at all hours. Russel and Zippy weren’t shy about living amongst people. Russel would fumble through his various plastic bags and Zippy would search through every compartment of her rucksack unzipping and zipping them up one by one as she went and repeating the process until whatever item was eventually found, often under the light of an Iphone LED light that could rival a small star so as not to disturb anyone by flipping on the light. Around the town, Foz is a contrast to Cuidad del Este. Pretty avenues and clean smoothly paved streets of quality shops and cafes. More expensive too, and seemingly not so busy. January and February are ‘high’ season for vacations but Foz still felt tranquil and laid back. Perhaps all the people were busy harvesting the tax-free fruits of Chinese slave labour over the river in Cuidad Del Este. On the third day, I set off for the falls on the Yamaha. It was an easy ride. Turn right on Avenida das Cataratas and continue along the Avenida until you come to the Cataratas. The visitor centre is set well away from the falls, about 10km, which means parking the bike at the car park at ‘car’ prices (no discount for having fewer wheels or taking up half as much space), queueing to buy a ticket and then queuing in the airport-sized queue for a bus to the falls. The bus terminal was packed. I’d got there early so as to beat the rush along with everyone else in Brazil having the same thought. Once on the bus, driving through the forest cooled and refreshed me ready for the stroll along the river. We all evacuated the bus at the first viewpoint to jostle for a good view and photo opportunity of the falls before we drifted down the path in a herd. The mammoth falls roar through the valley parallel to the trail. Selfie sticks and arms stretch out across the trail to obstruct the dense flow of tourists along the narrow path. Even the most leisurely of paces is forced down to an energy-sapping dawdle. Success in passing one group allowed a brief few paces before being blocked by another. I told myself there was no rush and to go with what there was of the flow. this was a strategy difficult to enjoy. Ducking under selfie sticks felt far more progressive and engaging whatever the result. I’d finished the snaking trail that links the succession of viewpoints within a couple of hours and had returned to the visitor centre by lunchtime. The queues had now all evaporated into the mist of the waterfalls. There was nobody left waiting in the departure hall. Arriving at Noon is a far better choice. On the way back to the Mandala, I took a detour to see the triple frontier from the Brazilian viewpoint. In contrast to the Paraguayan side, which you can see in the picture, this view to the triple frontier had been fenced off and sentried by a ticket office. Restricted to paying customers only. Artificial scarcity is a great business strategy: take what’s already free and sell it back to people. I’d already seen the frontier from Paraguay anyway and I could see Paraguay from the car park for free so I looked across the river thinking about tomorrow’s visit to the Argentinian side of Iguaçu Falls. Turning north onto the supercarretera from Ruta 7, the airstream blew the edge off the heat of the afternoon sun, I reflected on the enjoyable day and its variety that emerged from another step into the unknown and the unplanned. I’d coasted around Cuidad Del Este, killing time I would have called it in the past. The Triple Frontier: there’s nothing to see apart from a couple of lookout points that look out over imaginary lines from a different direction, almost like the tale of “The King’s New Clothes” Man-made lines drawn on a map that exist in reality only by collective belief and then define which set of rules apply to which people that live on whichever side of the river. The trees and plants look the same. The bird that flies over my head across the river to Brazil has more freedom that we do. Where’s its passport? I take a photo over the river anyway. Invisible walls that are used to imprison ourselves using our own minds. It’s brilliant. I realised I’d been daydreaming and couldn’t tell how long ~I’d been travelling or how far I’ve gone and pulled over to check the GPS. I’d passed it 8km back, quite a way considering the original distance was only 17km. I doubled back to an entrance with a sign the size I can’t believe I missed. Two guards asked me for my permit. I didn’t understand what they wanted and handed them my passport so they phoned Juan at the visitor centre who instructed them to send me in. They point along the track. “7km,” they say. I clipped my helmet to the rack and notice my hat and waterproofs have worked their way loose and escaped somewhere between here and Cuidad del Este. I rode ‘hatless’ along the track. There had been rain recently, within the last day or two judging by the thin dry crust concealing the underlying slick and sticky terracotta. The clay coagulated on the tyres, eliminating what little grip I had and I slithered along the road trying to follow the dryest looking tyre tracks to stay upright. I reached the reception within about twenty minutes or half an hour. The second set of guards asked me for the permit which I didn’t have. Juan came out of the visitor centre and waved them away. Apparently, the person who authorises the permits isn’t at the ITAIPU Reception where I should have visited first. I remember seeing their huge entrance a few km south of here. The Parque is closed to visitors for the next two days. I felt fairly privileged and I wasn’t really expecting to gain entry so easily else I would have thought about buying some food on the way. With the guards on the gates and the long slick driveway, it was enough of a deterrent for going back out for groceries. Plan B: was to ride to Hernandarias to a campsite there if I couldn’t enter Tati Yupi. Plan C: I’d been meaning to try a three day fast for a while so here was the perfect opportunity. Plenty of time, no food. Two birds, one stone and all that. The staff left the office for the new year holiday and would be back in a couple of days. There was just me, a couple of guards on the gate and the drowned ghosts of the river Paraná. I was 7km from the road so could hear no traffic and there were no fireworks or boom boom music. Apart from food, the only thing I missed was somewhere comfortable to sit. Wooden benches were all there were. WiFi was out of range of the power sockets so a relay between the two sets of hard benches was necessary. I found it hard to concentrate, having no comfortable workspace. I wandered down to the river, or lake such is the immensity of it. The thin line of the Itaipu dam protruding above the waterline gave a hint as to the impact of the building of the dam. The flooding of the river buried the most powerful waterfalls in the world making Iguazu the successor. The water was lower than maximum revealing the sharp mussel shells on the dry beach of cracked mud. Enough to turn me back to the soft grassy bank from where I embarked barefoot to the water for a swim. I’d done 24-hour fasts before but this experiment was different. Day 1. Nothing to report. I’d done 24 hours before regularly. Edited some video and walked along the river Parana lagoon shore above ITAIPU Dam. Day 2. Heavy limbs, listless, no energy for anything except reading, no capacity for study or thought. Forget blogging or video editing. Looking forward to forum reports of ‘feeling amazing Day 3.’ The consoling thought that I was now two thirds through and only a day to go. Day 3. The ‘feeling amazing’ feeling never appeared. Heavy limbs, nausea, ‘never-again’ feeling, I was tempted to abandon the experiment, even so close to the end. A passing thunderstorm took the heat out of the day and made the tent bearable and helped me sleep through the day and night. Day 4. The 72 hours finished late in the morning. I still felt weak and didn’t feel like cooking or eating but I cooked up the pasta and ate half of it. I had to exit Tati Yupi the following morning so I had a full day for recovery. It took an hour or two after eating before I started feeling better. Then I finished off the rest of the pasta and spent the rest of the day reading and finished a couple of half-read kindle books. Day 5. I felt almost back to normal and happily packed and loaded the bike. I rode into Hernandarias to search for a ‘comedor’ for breakfast. The best I could find served a plate of a segment of sawn-off leg, rice and creamy sauce with a vegetable salsa plus a litre of apple juice and soya. It was the best they had, barring chips and coke. I could only finish a third of it. It looked like I’d just stirred it with my fork and left it but I was full and keen to go to the ITAIPU-Dam tour, just down the road. Evening meal was a small chicken lomito (shwarma wrap) with a couple of glasses of Mango juice. Starter size, but I was full. Day 6. Breakfast at the Hummingbird Hostal was a jam sandwich, a cup of coffee and orange squash. Enough to see me through to Chicken burritos and Peach juice in the evening. It was hard to tell if there was any benefit for the fasting. True, I felt good now but I didn’t really feel bad before. And how do you gauge a healthy immune system without the illnesses that reveal its weakness? It reminded me of the preventative Y2K work that was done in 1999 and bosses complaining about wasting the money on it since nothing bad seemed to happen when the year 2000 clicked over in the digital universe… As it was, I’d only been ill twice in the year I’d been here in South America. Once through dehydration and once as a side effect of the Yellow Fever jab: both self-inflicted. Cheap; Solved the problem of arriving at Tati Yupi without food for four days; Cooler body temperature for sleeping in the hot climate; Constipation for 5 days (handy for being out and about later); No longer craved food; Gone off beer in favour of fruit juice; Smaller appetite; Smaller stomach; Broke lifelong conditioning for clearing my plate because “There are people starving in Africa”… i.e. less pressure to finish off a plate of food since I feel full sooner and finishing is a bigger stretch (literally); Feeling more energetic (2 days after); Feeling more contented for no identifiable reason (2 days after). Preference for more fresh food and less junk. Limbs feel twice as heavy (Day 2 and 3); Bored; Depressed; Chronic discomfort standing, sitting or laying down; Unable to exercise; Unable to think or write; Chronic back-ache; Nausea; Unwilling to move; all these during the fast. Have food ready for the end before you start. Luckily, I carry a jar of pasta sauce and bag of pasta in my kit for emergencies. Have someone close for support – it’s a hard haul on your own. If you have a medical condition don’t do a three day fast without medical advice, as your blood sugar might go haywire. I made my own choice and accepted the risks I was aware of as well as any I wasn’t. Have someone with you for support. If food is to hand it’s harder to resist the worst of it but have something prepared ready for completion. If there were crisps or ice-cream about I might have failed. The nearest store was 10km away and I had to pass two guard posts for the refuge to get there – enough incentive to stay put. Drink lots of water even when you’re sick of it. It will help. I could have drunk more but often I didn’t care much during the lowest feeling moments. This is where moral support helps. Would I do it again? In the same circumstances… only if I had a hammock or a comfortable bed… the discomfort of camping felt a lot worse during the fast… and facilities to make tea. I had developed a backache that was slow to fade afterwards. Also, I’d look for a group for mutual support and a more controlled environment, like at a retreat. Plus, I might research it a bit more along the way. The main thing was, I had survived New Year in peace and tranquillity, just what I wanted. I set foot into a new year, cleansed by a three day fast, poised to cross the Rio Paraná into Brazil. ON THE THIRD morning, I packed away, at Parque Manantial, and was away from Hohenau, through Obligado and Bella Vista northwards on the 250KM jaunt along Ruta 6. Within a couple of hours, black clouds closed in and I raced the storm to the next petrol station 3 km up the road and only losing the race by about 500 metres, enough to get wet but without getting soaked through, and sheltered under the canopy of the fuel station licking an ice cream over the twenty minutes of rain. I resumed my journey, drying out in the cool post-storm air. Ruta 6 is fast and busy but not half as much as Ruta 7 running east into Cuidad del Este. High-speed dual-carriageway thick with trucks and buses. I could use another 20km/h to feel safer but don’t want to rev the engine that high, even if it could reach that speed. It’s early evening as I settle into the last few kilometres down the dual carriageway toward Cuidad del Este. I get a thumbs up from a rider joining Ruta 7 from the slip-road and I give him a wave before he speeds away. Entering the city, I take the service road with its speed humps so I can slow down and look around more. Ruta 7 ploughs on through the heart of the city and eventually over the Rio Parana bridge on the Brazilian border. In the west, we have motorway junctions with elevated roundabouts and on off ramps. Not here. We are on the same plane. A roundabout with a dual carriageway bisecting it. Speedhumps regulate traffic so if you doze at the wheel, you’ll be launched into the air but not high enough to clear the crossing traffic. It’s all negotiated by trust, eyes open or closed. Give way to those braver than you or those you can see aren’t looking your way. I find my way south through the city to Pousada Del Monday, counting the junctions on Maps.me as I go. Pousada del Monday is a farm on the suburban edge south of the city next to the Saltos del Monday park (Monday Falls.) Mario finds it hilarious that I say in English Monday means “Lunes.” It’s a Guarani name and not the day of the week. After pitching the tent, in the field, I stroll up the shop to buy a beer as a substitute for dinner and return. The deposit on the bottle is as much as the beer. therefore, you see no glass beer bottles littering the street… just plastic. There’s not a whisper of a breeze and my tent feels like a sauna so I wander across the field down to the picnic shelter to enjoy the beer while watching the sunset. Darkness slowly descends and I return to the tent and zip myself into the muggy interior. Saturday night music blares from over the treetops in the near distance. Fireworks pop and bang. Predictable, even though it’s only 29th December, it’s still Saturday night. The noise and a rogue mosquito make for a long miserable night. When it wasn’t biting me it was whining in my ear. Morning creeps around and I walk up the drive in anticipation towards a favourably reviewed vegetarian restaurant just up the road to find its under major refurbishment and closed for two weeks and I carry on past to drop off the bottle and collect my deposit. If there was any doubt whether I should move on that morning, this tipped the balance. I decide to pack up and head up to the Tati Yupi refuge, a nature park above the Itaipu Dam. The plan B was a Christian Campsite at Hernandarias not far from there. I dripped sweat packing away it was already so hot. I removed my fleece and put it on the chair next to the tent with my bike key on top of as I packed away. What could possibly go wrong, there was no-one about. I turned around to discover a cow chewing the sleeve of the fleece and, as I lurched toward it to grab it, it took off across the field with my fleece, dropping the key in the grass. The cow dropped the fleece in a small stream as it jumped across. I retrieved it and retraced my steps to find the key. I found it fairly easily but vowed to always keep the key clipped to my belt as I usually do. Somewhere else in the field lies the charge cable for the GoPro that was in the fleece pocket. Pulling out of the gate, I ignore Saltos del Monday Park since foreigners are charged five times more than locals for entry, at $10US, and settle for a photograph of it from the road. I was hungry so the priority was to hunt for a cafe for breakfast that’s open on a Sunday. I cruise northward to the City centre and end up taking a tour around it with still half an eye out for cafes, observing the bustle of busy glass-fronted malls surrounded by terraced market stalls along the streets, stacks of flattened cardboard boxes and the sound of packing tape being ripped off reels and wound around newly purchased electronics and old cardboard. This is a mad place. Hoards of Brazilians flock across the border to save a fortune in Brazilian sales taxes. Paraguayans import cheap (and fake) goods from China to capitalise on the opportunity while customs officials are kept busy with documents and rubber stamps, panning for fees and penalties like gold prospectors. Of course, not all goods are fake but it’s up to you to tell the difference and I’m sure you can find what you want if you know where to look. I needed a GoPro cable and came across a street vendor that finally had one. Yes, it fitted, No it didn’t work. It’s hard to tell whether there is any actual wire in it. I rode back down to the Triple Frontera with Brazil. Argentina and Paraguay. I should have gone there first as it’s not far from Pousada del Monday but I had been thinking of food at the time and was even now still on the lookout. I’d read about the triple frontier years ago, about it being a hotbed of smuggling but I don’t see how unless the guards are in on it as you can see in all directions of the river. The way I see it, Ponta Pora and Pedro Juan Caballero is the place to go since there’s no river or fence separating the two countries. The Triple Frontier was quiet. No cars were waiting on the ramp, no ferries were running and I looked east across the river at the Brazilian Viewpoint to the left and the Argentine Viewpoint to the right. The place was quiet enough for a camping spot but there’s nothing much to do, especially on a Sunday. On the way back, I finally discovered the restaurant that seemed to be the only one open, busy with local customers (always a good sign) and nestling in the cheaper suburbs. I parked the bike under the awning of the closed store next door to keep it out of the searing heat of the midday sun. Chicken and noodles with mandioca and a coke. Basic food, dirt cheap. Body refuelled, I returned to the city and explored the streets around the glass-fronted malls on the main roads again. Maybe I could get a new battery for my Hero3 GoPro. No, Hero4 is the oldest they cater for. I’m obsolete already. Not even a cheap Chinese knock-off to be had. Round the back of the impressive high rise glass facades and flashing LED signs luring customers from among the shoals of shoppers, people in rags cook skewers of meat on homemade grills at the sides broken concrete streets while paper and plastic trash tumble in the breeze. A city with a facade as false as the brands it is peddling hiding the harsh lives that many people face. ‘Money makes the world go round’ so they say. It’s more like, the lack of money stops the world for those that don’t have it. “Me? Just looking, not buying, thanks.” There is something very much “buyer beware” here and I can’t imagine any after-sales dispute being settled easily. Stores started closing at 4pm and the traffic soon built up to plug the only route back to Brazil, the single bridge across the Rio Parana to Foz do Iguazu. The whole situation is crazy when you think about it. A whole ecology manufactured out of the artificial scarcity that bank-money creates. People trying to save their earnings from exploitative taxes in Brazil, people trying to make money from the differential of the price differential of local sales prices and the minuscule wage of Chinese workers and whatever’s left over from corporate profits. All this impacts quality and abundance. When I look around this continent, it is abundant in natural resources and manpower and it all seems ultimately choked by who controls the money. It’s a banker’s world and they are making a hash of it. BOXING DAY, PACKING to leave the Maui Waui International Hostel in Encarnación, I notice the new back tyre is flat and cursed the Chacomer fitter back in Asunción. The bike is now fully loaded and I give the tyre a splashy kick to confirm its soft appearance. I don’t want to deal with it now so I inflate it and hope for the best. The pressure holds without any noticeable drop in the 5 minutes I finish tying up the loose ends. I smear a film of spit over the valve and its bubble remains flat. The leak isn’t at the valve. Hohenau. Stopping at the first set of traffic lights to check maps.me for the exact location, there it is on the screen, a km back: Camping Manantial. I pull into Parque Manantial mistaking it for a cheaper place the other side of town not realising until I pay for 3 nights at G50,000 per night. The woman on the gate speaks only German or Spanish, as do the owners. “Sprechen ze Duetsch?” “Nein, lo siento. Ingles?” “Nein.” so it goes. I pitch my tent on the edge of the woods and the grass field furthest from the swimming pool. Good thing too as the usual bass rich music starts pumping out of a speaker down near the restaurant. Parque Manantial is a well-presented place in woodland and fields over enormous grounds, hosting a popular swimming pool and smart restaurant. The location I had chosen to camp was far enough away to feel private. There are power sockets and I am at the limit of a WiFi signal but I’d go to the Restaurant for better reception. The buffet breakfast is delicious and the air conditioner in the Restaurant makes for luxurious relief in the muggy heat. Back at the tent, I break out the spares and tools and replace the inner tube of the back tyre and discover a hair’s width piece of wire in the back tyre, penetrating the inner tube. My suspicions about Chacomer were unfounded. In any case, I had taken a week to get to Encarnación without any problem. I took it all back forgiving my suspicious nature and apologising quietly to my innocent victim. I need some tyre levers to make the job easier. Bendy spoons and pliers make hard work of the task. Victor Hugo Benitez approaches me in the restaurant on the second morning. He’s the Chacomer Yamaha area supervisor for the whole of Paraguay and invites me to a barbeque at one of the dealers that is exhibiting the latest Yamaha bikes in Hohenau and I gratefully accept. I ride up to Hohenau at 7.30 and meet half a dozen bikers already chatting together and over the next half hour, more bikers come rolling in from the north of the town. I sit and talk to Doda and his wife. They grew up in Asunción but their families moved up to Bella Vista 6km up the road to escape Stroessner’s curfews and hard rule years ago. Doda’s wife told me that Josef Mengele worked as a doctor in Obligado, in the next village, after the war and did a lot of good for the people here. Bad in war, good in peace. Toward the end of the evening, a speech was given to round things off and I was honoured with a round of applause for my trip from Peru on the little Yamaha YB125, the smallest bike at the meet. STRIKING CAMP AT San Cosme, I retraced my way back through the grassy network back up to the Observatory on the Plaza. Then took the ludicrous decision to head for the Trinidad and Jesus de Tavarangue missions only because I already had 2 days left of a 3-day ticket in my hand. These were 40km further on from Encarnación and I would pass them later anyway on the way to Cuidad Del Este. For the sake of £2.50, buying another ticket made much more sense, if only I had spared the thought. Another short leg of 125km meant I could set off late and look around the San Cosme Mission between combing the surface of the sun for sunspots and pushing on for Encarnación along the solar heated asphalt. Unesco denied issuing a world heritage certificate to the San Cosme y Damian mission as it had been restored too much. Unesco likes things to be a little more ruined. I liked it restored. Besides, there are two less improved ruins not far away and they give a good contrast to a common template: the layouts are basically similar. Looking at the building here and learning about how they lived I think I might have liked living as a Jesuit if it wasn’t for the threat of the Paulista slave traders raiding the countryside for easy pickings. A hot, bright day made the going tiring. Keeping the pace fast and swinging out of the way of the speeding trucks and buses away from the line of sight of the tired driver’s drooping eye-lids, I stopped to rest in the shade of a bus shelter about 15km from Encarnacion. I removed my helmet and slumping on the cool concrete seat, under the hot concrete canopy in the warm concrete shade. Across the road, a silhouette of a man under a tree waved at me. I didn’t really want to be disturbed but he beckoned me over the road. The path of least resistance was to join him. Aristedes is his name and he runs the tyre shop right opposite the tree but there was no-one around to keep him busy. He straightened up a ubiquitous plastic patio chair, the modern emblem of third world living, and asked me about my trip. He showed me his Honda Titan 125 propped next to him, cleaner than mine and probably newer, and talked bikes. We sat in the shade for a while away from the heat of the day, two parts silence, one part conversation. He rose from his seat and went into the tyre shop saying “Una minuto.” and emerged from the dark doorway carrying a half litre bottle of ice-cold mineral water, sparkling with a sheen of condensation and Aris refusing offers of payment. He sipped his terere and me my water. “Calor, e?” “Si, mucho!” and we sat in the shade of the tree watching the faint orange wisps of dust drifting down the verge from the passing traffic in the hot breeze. Arriving at Encarnación was as if I were transported to a laid back version of a European resort town with its seafront. Sunshine brilliance. I took a detour, turning right along the costa instead of left, inland towards the missions. The riverfront opened out into a wide promenade and the sandy beaches reminded me of seaside towns back in the UK on heatwave days, Cleethorpes perhaps, except that it wasn’t Hull visible across the water. On the distant southern shore of the river, silhouetted against the sky stands the tall modern looking Argentinian city of Posadas, far enough away to look immaculate if it isn’t already. I pulled over to the curb, kicked down the side stand and climbed off the bike to walk along a pier and take some photographs before continuing along the promenade following the river. The road followed a long gentle right-hand curve around the contour of the river followed by a long smooth left, banking slightly, a jolt and grinding noise shook me to attention. I’d forgotten to flip up the side stand and had been riding with it down for about a mile and the left-hand bend now brought it into contact with the road lurching me toward the side of the road. Braking firmly but delicately and keeping the grinding down to a minimum, I managed to stop before the right side of the front wheel met the edge of the curb. I made a mental note to lubricate the stand so if it happened again it might flick up all the way on its own. I’d gone far enough anyway and swung a U-turn and took a route through the city to resume my route toward the Jesuit missions. iOverlander indicated a wild camping spot between Trinidad and Jesus de Tavarangue. Ideal looking location on paper or screen. I meandered through Trinidad and caught a glimpse of the ruins from the viewpoint on the hill before continuing to the camping spot. The access wasn’t readily apparent and I passed it looking for a more obvious entrance but this was it, a drop off a large step of asphalt onto a steep loose earth lane down a fairly steep slope to a flat area only about 30 metres from the roadside but mostly hidden by the riverside woods. 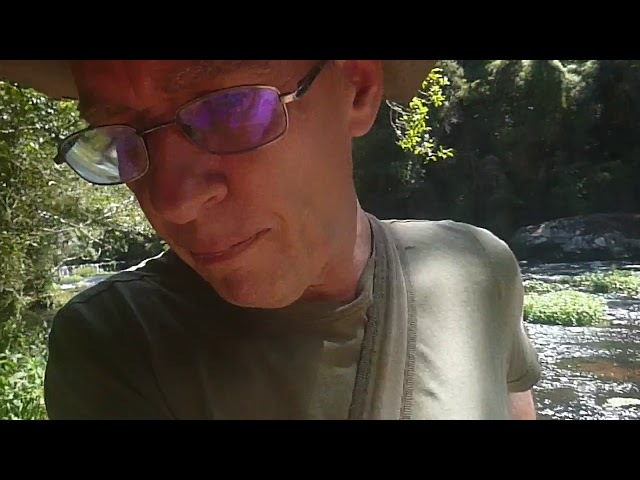 The bank to the horseshoe-shaped river bend was steep and loose and the water an uninviting coffee coloured turbulence about 8 meters below where I decided to pitch the tent. The amount of litter suggested I was unlikely to remain alone here all night but I was happy with it and it didn’t really matter. On the map, the road between Trinidad and Jesus looked insignificant but all night there was an unending flow of motorcycle, car and truck traffic invading my dreams and stretching the night out into a semi-awakened dreamscape. At dawn, three motorcycles arrive and the riders started hacking away at the undergrowth. They walked by my tent and we exchanged greetings and I fielded questions about the Peruvian numberplate before they headed down the bank and started hacking at branches. It wasn’t clear what they were doing since the place looked pretty wild but they were all busy with physical exertion. Bradt’s guide suggested embarking early to Trinidad since there was not much shade and it gets hot in the afternoon. The heat was already building here but I figured, I’m right here anyway, get it done in the heat and ticked off the list. The Trinidad mission is more spread out and has less shade. By noon, the midsummer sun was virtually directly overhead, only two or three days off the solstice, so the walls offered not an inch of shade. Halfway round I climbed a fence and rested in the porch of an abandoned church just outside the perimeter to read some more of the guide while pretending to cool down. The springy lawn felt like I was walking on a mattress. Walking felt energy sapping on every stride, like some authority imposing a tax on each step. There was more ground to cover here but I thought Trinidad lacked the quaint beauty of the mission at Jesus de Tavarangue. Afterwards, I dropped into the hotel near the ticket office for some lunch and refreshment. A woman with a beaming smile walked in. I asked her if she knew any good camping spots here, mainly for conversation but open to changing my plan of returning to Encarnacion. She didn’t know but escorted me to the Mission ticket office where she translated what the ticket office staff told her. I’d already been up to the hill with the viewpoint they were talking about before settling at the riverside woods and it felt too exposed for me. I just said thanks and left with a wave an adios. I wouldn’t see them again anyway. Trinidad was closer to Encarnacion than Jesus so the journey back didn’t take long. Cruising the streets, eyes peeled, I didn’t notice many hostels and there weren’t many listed on my apps, particularly at the budget end. Checking iOverlander, Maui Waui was just a block away around the corner and I pulled up outside. Nobody about so I waited in reception for half an hour on the WiFi until Jorge, the receptionist recovered from a siesta. I was shown a bunk in a 4-bed dorm and flopped onto the lower bunk and basked in the remnants of the cool breeze of the air conditioning above while chatting to Isaac, a Canadian involved with an ecological project in Paraguay and Brazil. Another traveller entered the room and stooped to look at me and I was stunned to recognise Martin from the El Jardin in Asuncion from about a week ago. I thought he’d gone to Brazil already. It’s the first time I’d crossed paths twice with a traveller in South America. Big continent, small world. The next morning was Christmas day and at breakfast, the woman with the beaming smile I’d seen at the Trinidad ruins appeared in the kitchen, Minerva from Colombia who spoke competent English. She asked me about the camping spot she’d divined for me up in Trinidad and I told her that it felt too public and exposed and I decided to come to Encarnacion instead. Encarnacion is a cute town with tree-shaded streets in the familiar latin grid pattern, spreading up the slope away from the river. Many of the hostels were closed, presumably for Christmas, but one or two shops were open and I got some beers in for the guys. Jorge invited me for barbeque but it when I asked when we would eat, it was going to be about 10pm. I don’t like eating that late and declined but stayed up sipping beer while Jorge was cooking. A tall European who spoke impeccable English but chose not to asked us what kind of music we liked. The Doors was one, Creedence Clearwater Revival was another. Classic Rock from way back using real instruments… anything other than thumping bass and electronic crap that drowns out a good time in night-clubs. I finally turned in at 11.30 and the food was still on the grill, to the beat of the thumping bass speaker and squawking electronics, underpinned with the mute harmonies of rumbling stomachs.